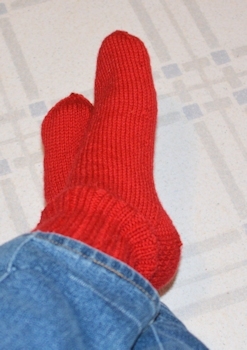 After finishing the Humbling Socks, I cast on a pair of red socks to take on the trip to Winnipeg. For one reason after another, they were not as far along as I'd hoped when I started out that day (the 12th) and the trip was the usual mix of expected and unexpected, but I knit every time I could without annoying others or making my fingers too sore. 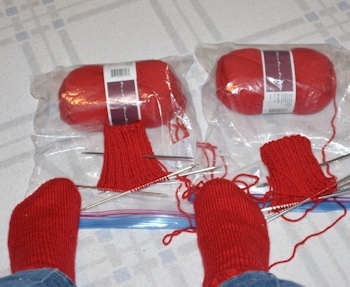 I also had along two more balls of red yarn for a second pair, if I got the first pair far enough along to start them. No pictures tonight, but I may add pix tomorrow. The first pair progressed well enough on the bus and train that I was able to turn the heels on the morning of May 14th. Not as much knitting got done during KeyCon (people are actually more interesting than knitting!) but some did. I started the second pair of socks at KeyCon, with most knitting moments still going to the first pair. By the time I got back to the starting point, I had finished the first pair, and had 3.5 inches of ribbing (out of 5 planned) on each of the socks of the second pair. I make more mistakes when knitting tired, in poor light, while being jounced around, and while being distracted. So I got lots of practice in fixing mistakes. The socks on my feet are the newly completed pair from the trip, their first wearing this morning. The cuffs are how far I got on the "following" pair on the trip. When I started the trip, the cuffs of the now finished socks were maybe half as long as the cuffs shown above...and became the socks on my feet. On the bus and train to Chicago, I finished the cuffs and the knit-only ankle part and most of the heel flap of both. In the hotel the first night I finished the heel flaps. The next morning, before heading to the Field Museum with a friend, I turned both heels. That night I picked up the stitches and started the gusset decreases of one sock before going to bed. The next day, at the airport and on the plane, I finished the gusset decreases and started the foot of one sock. In amongst the convention actitivities, I picked up stitches and got the gusset decreases of the other sock done, and both socks well onto the foot. I also cast on the following pair on Sunday (would normally have done that about the time I turned the heels, but didn't want four pairs of "live" socks with me on the flights) and up to about an inch of cuff each. On the flights back from Winnipeg, I worked on the new pair, with the others packed in my checked bag. On the next day, on the commuter train into Chicago, I knitted (an hour of knitting, almost)...and once on the train home knitted more. Found people interested in what I was doing, so time was spent chatting and demonstrating, as well as knitting. Still, I finished both socks the next morning (May 20), the second one only about an hour from the end of the train ride. Having the knitting along did not impede me in visiting the museum or interacting with people, and every stitch on the needles (that is not a mistake it's going to take time to fix) is gain. Here's the obligatory "socks on feet" shot. It's darkly cloudy this morning--it stormed last night and more is expected--so all pics were taken in the kitchen with flash and ceiling light. Works well for red socks. You're going to love Helsinki (if we get our WorldCon bid) People knit everywhere: in the pub meets, during speakers and seminars. It's just 'a thing'. Beautiful stitches, great colour, and they look like a cozy fit. I am really digging the colour of red these are. Beautiful!